This page gives a selection of Tim’s media appearances and interviews for radio and television, in print and online. In August 2014 Tim appeared in an edition of ITV1’s flagship current affairs programme ITV Tonight on outdoor play and risk. Read more about the programme here. In June 2013 Tim appeared in a piece on street play that was broadcast on the primetime BBC1 magazine programme The One Show. 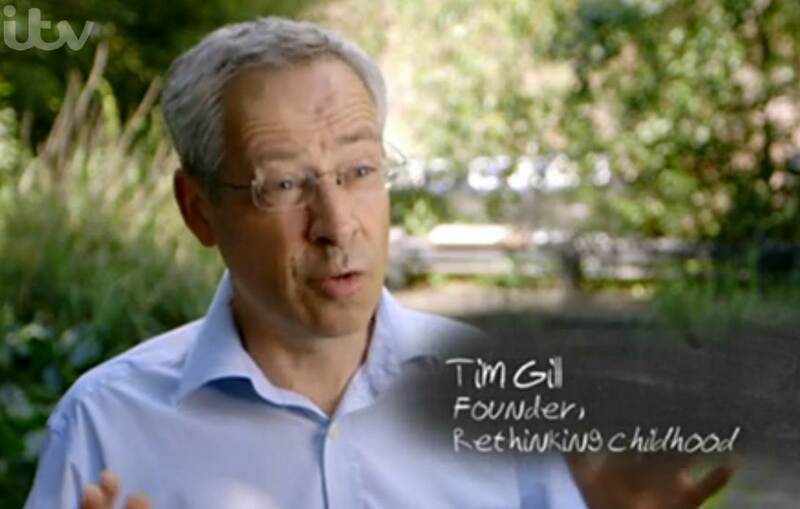 In January 2011 Tim featured in a documentary on childhood produced by ITV Tonight. In February 2010 he appeared in a programme on child protection made by the flagship BBC current affairs programme Panorama. In November 2009 Tim appeared in a feature on the leading outdoor and environmental magazine programme Countryfile on BBC1, giving his thoughts on how to reconnect children with nature. In 2008 Tim took part in A Revolution in Childhood, a televised debate on BBC 4 chaired by Martha Kearney. The programme was linked to the BBC’s flagship child development series Child of our Time. The programme was reviewed in the Independent. In April 2013 Tim was one of the panellists in a studio debate about character chaired by Mariella Frostrup – part of series 6 of the BBC Radio 4 programme Bringing up Britain. In October 2011 Tim was interviewed by Richard Aedy for the second time on the Australian ABC Radio National programme Life Matters (see below for the first interview, broadcast in Nov 2007). He argued that awareness is growing of the importance of risk and adventure in childhood. In April 2008 Tim took part in a studio debate on childhood chaired by Mariella Frostrup, in series 1 of the BBC Radio 4 series Bringing up Britain. Tim was on the panel for a discussion on Nightwaves on Radio 3 entitled Whatever Happened to Childhood? The programme was part of the 2007 Free Thinking festival in Liverpool (broadcast Jan 08). Extended interview with Richard Aedy for the Australian ABC Radio National programme Life Matters (Nov 07). Leading journalist Decca Aitkenhead wrote a feature for the Guardian that included an extended interview with Tim, when his book No Fear was published (Nov 07). In November 2018 the Quebecois child health website Centdegres published an interview with Tim (in French). In October 2018 the leading Austrian newspaper Der Standard published this interview with Tim (in German). Tim’s visit to the Moscow Urban Forum in Dec 2012 led to a number of interviews (all in Russian). Check the end of this blog post for links. Tim was interviewed in Juno magazine on free play, children’s retreat from the outdoors and whether technology is to blame (Jan 2012). The Belgian youth sector magazine and website Krax published an interview with Tim (January 2009 – in Dutch).